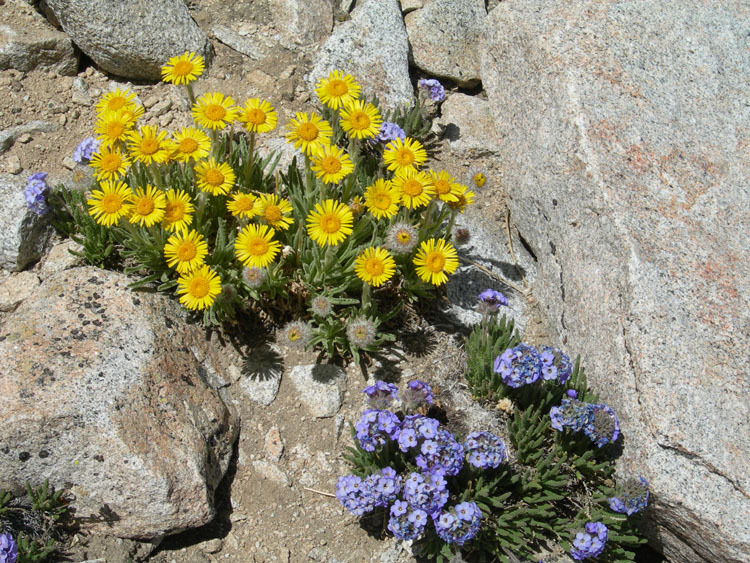 Not only is there a spectacular view from the top of this easy peak, the upper slopes are covered with true Sierra Gold (Hulsea algida) and Sky Pilot (Polemonium eximium) said to be John Muir's favorite flower. As Richard Stover and I leisurely backpacked from the trailhead by Rock Creek Lake, we were passed by trail runners heading for Francis Lake. By the time we got to the lake about three hours later, one of the runners was returning, having summited Mt. Morgan! He told us there was snow as expected, but that it was not continuous. We decided to camp on a sandy bench above the lake at 11,200' where there were fewer mosquitoes. We started hiking at 6 a.m. the next morning, determined to get the peak after having run out of time on Birch our last trip. Leaving our crampons in camp, we took our ice axes and ascended the ridge directly west of our camp. Once we attained its crest, it was an easy walk to the softening snow, then a straightforward climb to the summit which can be seen from the trailhead. This route avoids much of the talus encountered in the center of the drainage. From the summit there is an awesome view of Bear Creek Spire, Mt. Tom, Royce and Merriam, the Pioneer Basin, Humphreys and more. This image is very wide. Click on it for an even WIDER image! As we climbed, we spotted another party of five about an hour behind us. Since they didn't appear to have ice axes, they were more conservative in their route. Small world. It turned out to be Debbie Benham and other PCSers. They hiked out that evening; we relaxed in camp and hiked out the next day. Then we spent another day and a half exploring Mono Lake before driving home.